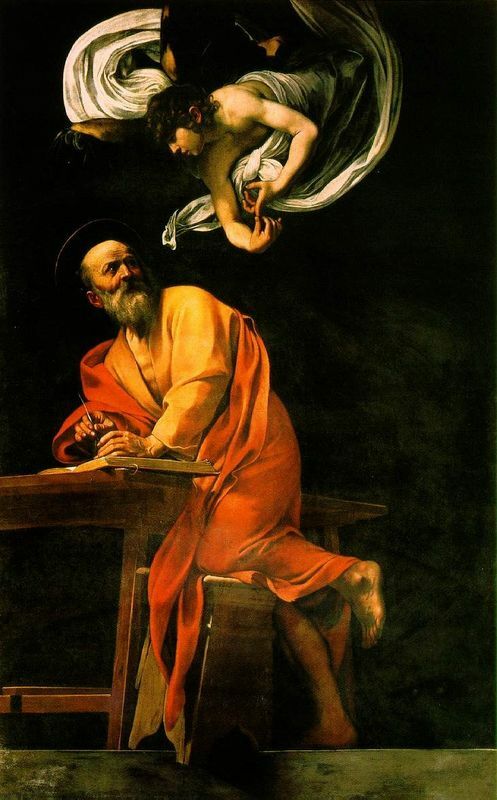 Saint Matthew was one of the twelve apostles, and author of the first Gospel. The tale of the calling of Saint Matthew is found in the New Testament, Matthew 9:9: "And when Jesus passed on from thence, he saw a man sitting in the custom house, named Matthew; and he said to him: Follow me. And he arose up and followed him." Matthew was a Jewish tax collector sometimes also known as Levi the toll collector. Avaricious and presumably money-mad, Matthew was to give up his worldly possessions and take to the straight and narrow path when Jesus called him into his service while Matthew was working at the tax collector's stand at the Capernaum. In this painting, Caravaggio depicts the very moment when Matthew first realizes he is being called. 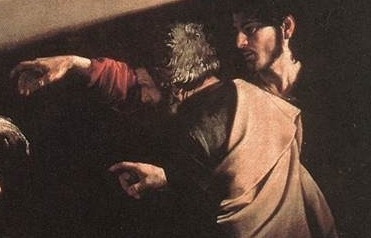 Caravaggio's The Calling of Saint Matthew was executed for the left wall of the Contarelli chapel in the French church of San Luigi dei Francesi in Rome. Cardinal Matteo Contarelli had saved for years to pay for the decoration of his chapel with scenes from the life of Saint Matthew, his namesake. 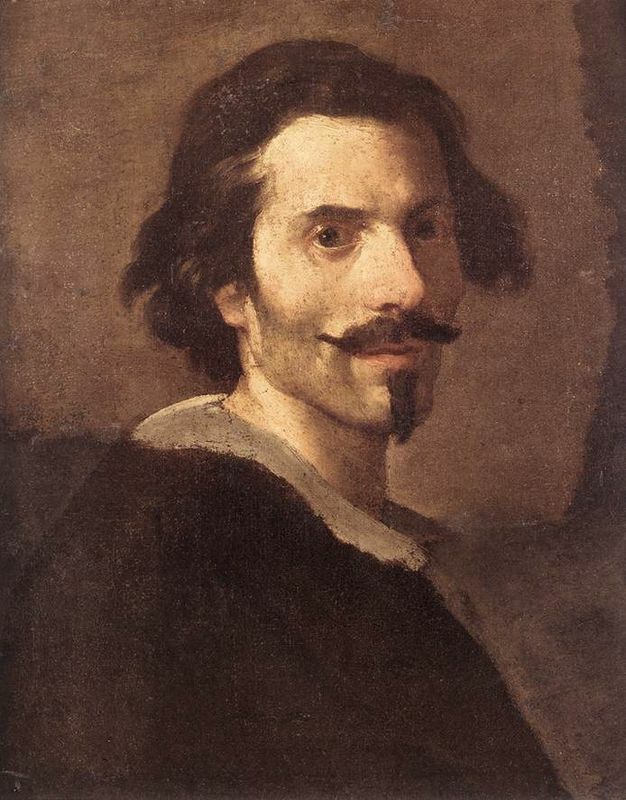 Caravaggio's former, flashy employer Cavaliere d'Arpino originally won the commission and executed some frescoes in the dome but was unable to complete the work due to his many other commitments. Luckily for Caravaggio, in 1599 his patron Cardinal del Monte pulled some strings to secure the commission for the young artist. This was Caravaggio's first important job and the completed work would win him the highest of praise as well as the harshest of criticism for its shockingly innovative style. In other works on this theme, Saint Matthew is depicted inside a building, with Christ outside (in accordance with the Biblical text) calling upon him through a window. 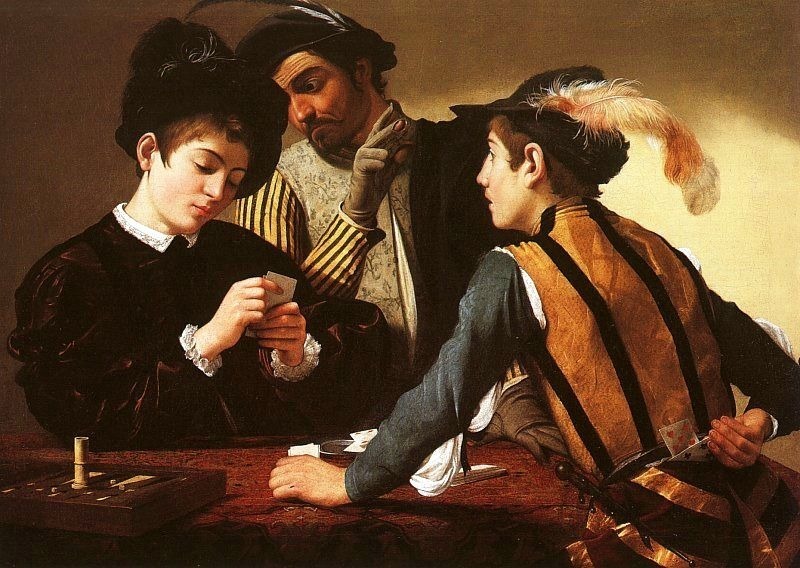 Both before and after Caravaggio this subject was frequently used as a pretext for anecdotal genre paintings. 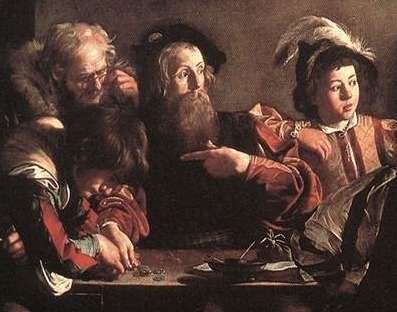 It's possible that Caravaggio was familiar with earlier Netherlandish paintings of money lenders or of gamblers around a table like Saint Matthew and his assistants. In this work Caravaggio draws inspiration from his own world, placing the biblical scene in modern reality. This work is evidence of Caravaggio's artistic confidence. He was not comfortable with the traditions of contemporary idealizing history painting and so he regressed to the subjects of his youth which had previously earned his success. 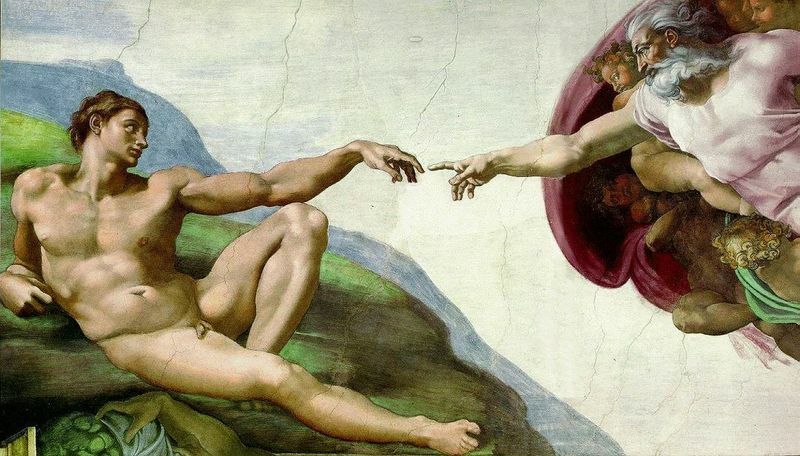 Additionally, in this work there is a likeness between the gesture of Jesus as pointing towards Matthew and that of God as he awakens Adam in Michelangelo's Sistine Chapel. The Calling of Saint Matthew can be divided into two parts. The figures on the right form a vertical rectangle while those on the left create a horizontal block. The two sides are further distinguished by their clothing and symbolically, by Christ's hand. 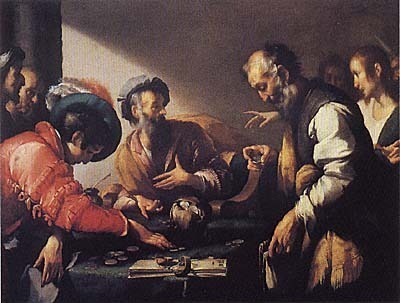 The figures that appear in The Calling of Saint Matthew are similar if not modeled by those persons in other works, such as Cardshaps. It seems that this painting posed problems for Caravaggio in terms of its size and thus he used this piece to come up with a solution for painting from life grand, complicated multi-figured compositions. The artist's use of light and shadow adds drama to this image as well as giving the figures a quality of immediacy. 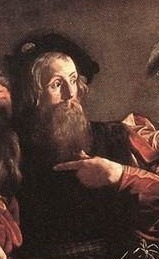 Many other artists later followed Caravaggio's example and copied this technique. 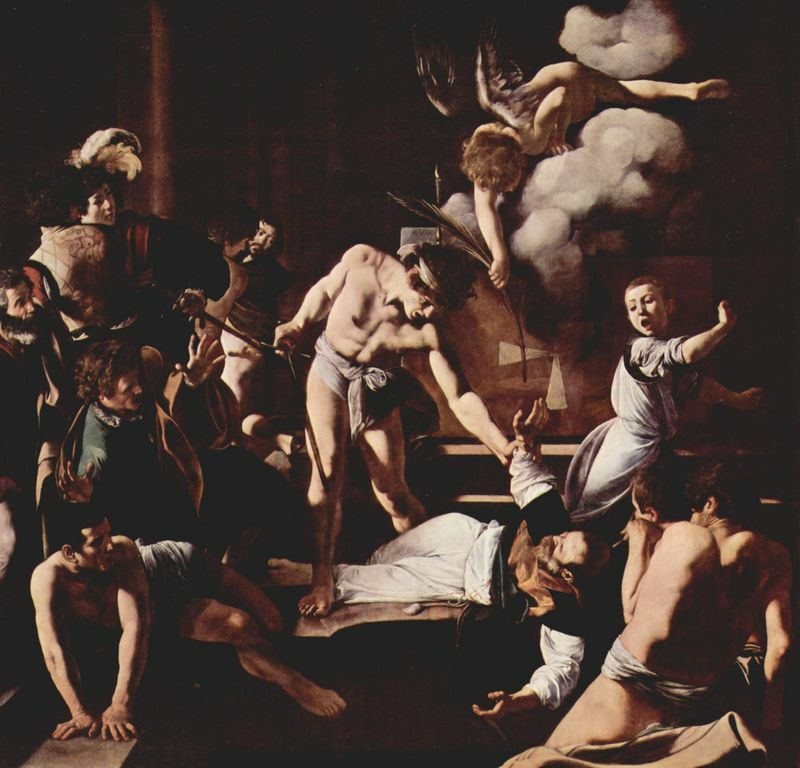 The figures are engulfed by shadow and it is only the beaming light that shines across the wall and highlights the fact of St Matthew and the seated group that brightens the canvas. Caravaggio brings this canvas to life with vivid colors; bold contrasts of reds, golds and greens and various textures of velvets and soft fur. He also contrasts gestures and expressions. The Calling of Saint Matthew is proof of Caravaggio's ability to show biblical scenes more realistically and unfolding before the viewer's very eyes. The artist was not creating a descriptive naturalism but instead focused on the physical reality of this particular scene. 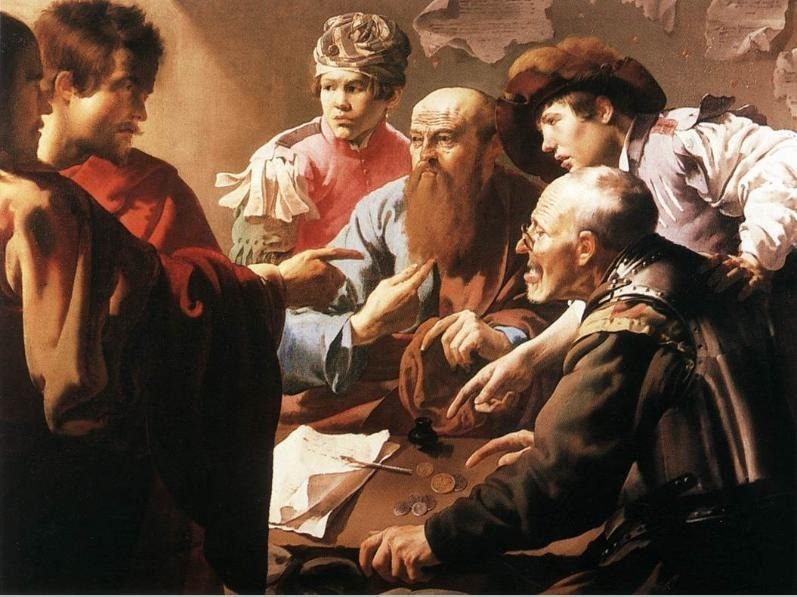 He drew on his earlier genre figures when creating this piece and the result in Saint Matthew and his cronies depicted as approachable figures to whom people could relate. This work was so different from Mannerist paintings of the time and this added to its popularity. 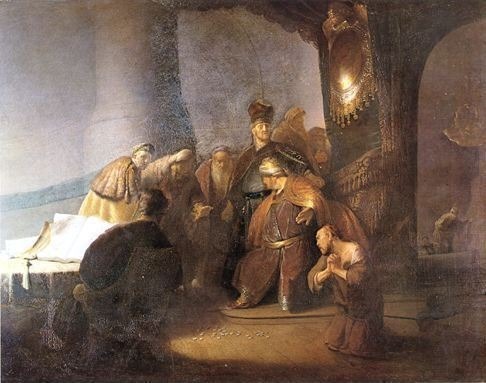 The Calling of Saint Matthew was particularly appropriate to both the place and the time, given Henry IV, heir to St Louis, had recently converted to the faith of his ancestors. 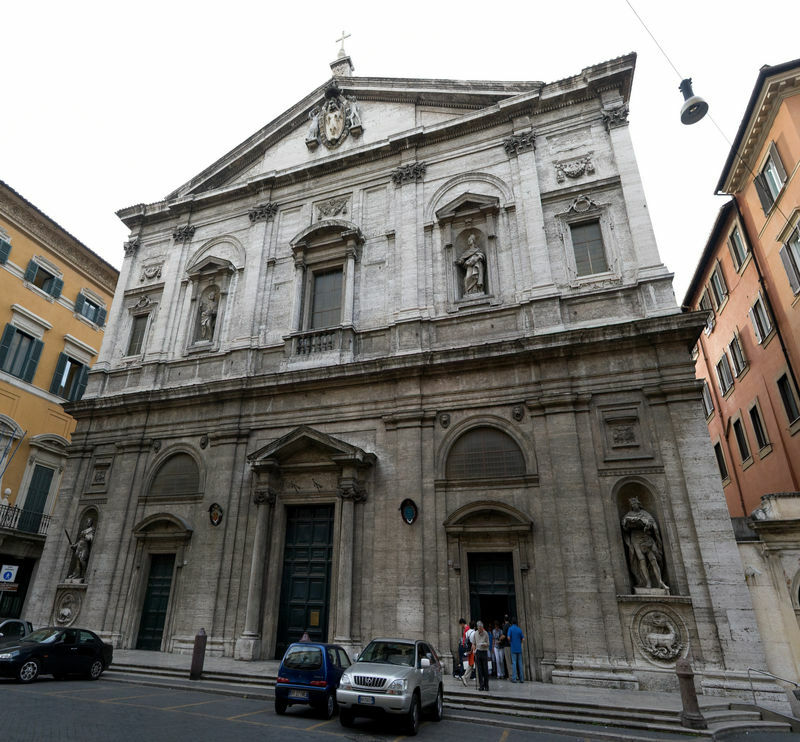 Furthermore, Caravaggio's other works for the San Luigi dei Francesi, the French Church in Rome had already served to establish the artist as a leader of the new naturalistic movement in Rome. 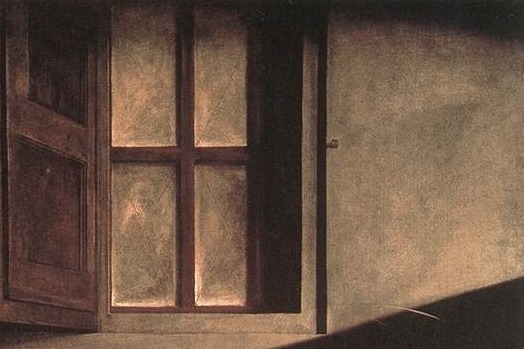 As a contemporary critic noted, "a characteristic of this school [of painting] is to use a focused light source from high up, without reflections, as though in a room with a [single] window and the walls painted black. In this fashion the lit and shadowed areas are very light and very dark and give enormous three-dimensionality to the painting, but in an unnatural fashion neither done or even conceived before by such artists as Raphael, Titian, Correggio, or others. " 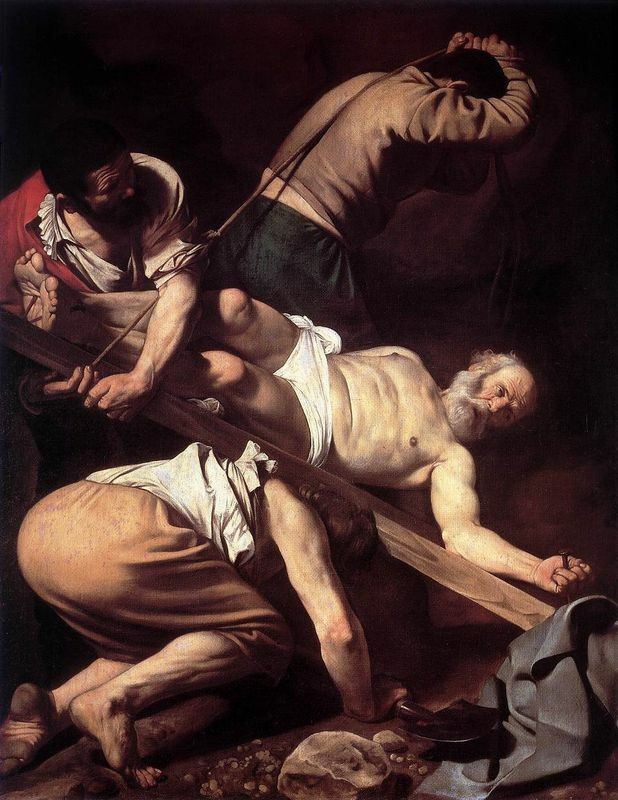 Most of Caravaggio's commissions after 1600 were for religious art and these works were new and raw. As a result, reactions to such paintings were mixed. 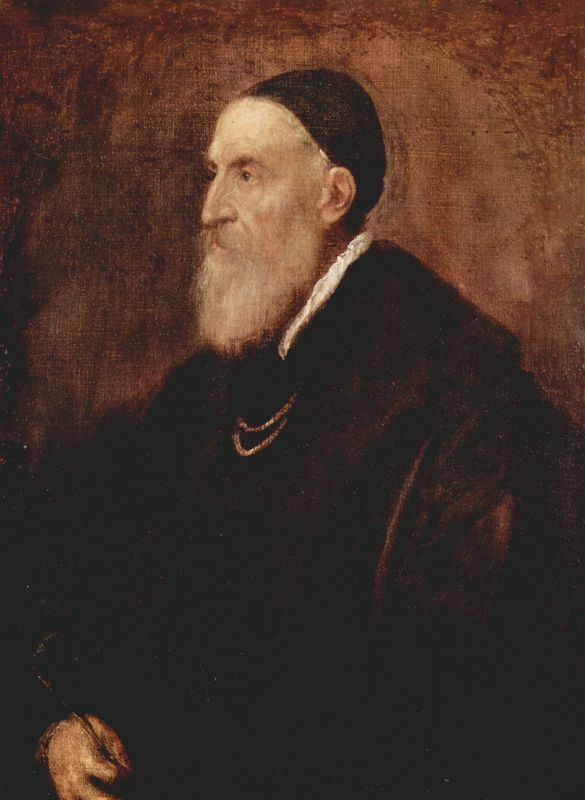 Occasonaly, his powerful and sometimes shocking naturalism was rejected by patrons as unsuitable but this very realism was in keepinh with Counter Reformation ideas of spirituality. Caravaggio's talent shone through in these works and cardinals, noblemen and religious authorities overcame the shocking newness of his paintings and were moved and enchanted by what they saw. Caravaggio is a pioneer of the Italian Baroque style that grew out of the ruins of Mannerism. At the end of the 16th century, the artist was exposed both to the artistic reforms of the Counter-Reformation as well as to a new interest in scientific naturalism flourishing in northern Italy, due in part to the influx of artworks from northern Europe. Out of this context, Caravaggio developed a style of unflinching realism, unprecedented approachability and a direct appeal to the emotions that had no equal among his peers and helped to mould 17th century Italian art. To read more about Caravaggio and his works please refer to the recommended reading list below.